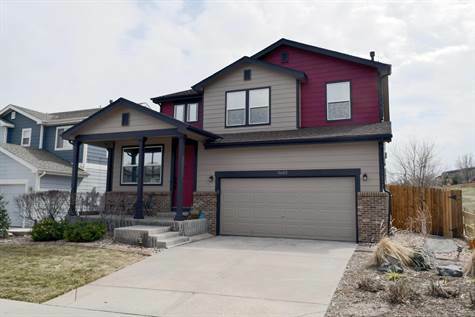 Come and see this well maintained house in Highlands Ranch and make it the next place you call home! Each floor features central living spaces perfect for making new memories. Relax in the movie and bar areas in the basement, entertain in the open living concept kitchen/dining/family room around the cozy fireplace, and enjoy the second floor living area at the top of the stairs. The master bedroom is light and bright and features an en suite bath with a stand up shower, a soaking tub, and huge walk-in closet. Also upstairs are the second and third bedrooms, each with nice closets, and a big central linen closet. The fourth bedroom in the basement feels above grade with a large egress window and full bath just outside the room. Other highlights of this beautiful property are a large partially covered patio, 2-car attached garage, front loading washer/dryer, huge kitchen pantry area and upgraded appliances including a 5-burner gas range. This great location is close to walking trails and backs to open space.